Lesser White-fronted Goose is a globally threatened species that is included in Annex I of the Birds Directive (79/409/EEC). In the breeding areas in Fennoscandia the species is ranked according to the IUCN criteria as Critically Endangered (CR) in the Red Data Books of Finland, Sweden and Norway. The SPEC category of the LWfG is SPEC 1 (Species of global conservation concern). In 1996, the European Commission published an international Action Plan for the Lesser White-fronted Goose, in which locating and assessing key areas is ranked as the highest conservation priority. Further on, promoting the legal protection of the species and the key sites, reducing the hunting pressure, managing habitats and prevent further losses in the staging and wintering grounds, were listed as high priority actions in the international action plan. Other high priority actions in the action plan are: monitoring the remaining populations and raising public awareness of the species, and promoting the use of international conventions for the protection of the species together with direct discussions between range states. 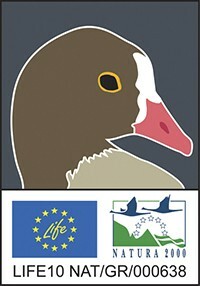 The previous LWfG LIFE project carried out conservation actions prioritised in the (1996) international Action Plan along the European flyway of the species. During the project, the international action plan of the species was updated, and the new International Single Species Action Plan for the Conservation of the Lesser White-fronted Goose Anser erythropus (Western Palearctic Population) was adopted by AEWA in 2008. The LWfG LIFE project took actively part in the preparation of the plan.